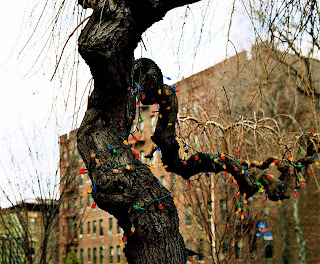 I have been waiting, and repeatedly forgetting, to take a picture of this tree with its skimpy wrap of lights since it was festooned in December. I'm not usually a fan of colored lights but outside and with this size and on an interestingly shaped tree it really works for me. Next year maybe I'll catch them when they're lit up.